Raa Atoll is one of the famous atolls in the Maldives, housing some of the best resorts and bucket list worthy sites. One of the islands that form a part of this atoll is the Vaadhoo Island. This spectacular island may have roughly 500 inhabitants but the natural phenomenon occurring here - known as Sea of Stars - is one that captures the attention of people all around the world and leads them straight to the shores of Vaadhoo which delightfully serves them with one of the most memorable sights. The Sea of Stars phenomenon is the name given to the mesmerising waters of Vaadhoo Island when they glow a brilliant blue under the moonlight. The sea is said to glitter and glows in such a manner that it reflects the stars beneath which the waves lap. This phenomenon occurs due to the various phytoplankton that can be found in the sea and glow in the cover of the night. Although this phenomenon is more of a self-preservatory gesture for the fish, the light emitted in the sea is almost mesmerising. 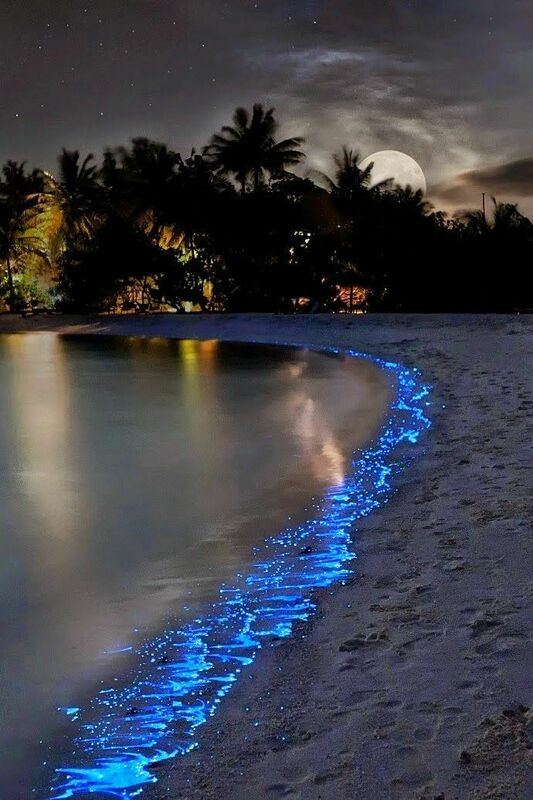 Therefore, when visiting the Vaadhoo Island be sure to venture to the shores for a midnight stroll and look upon the glowing sea that will not only be an imprinted in your brain forever but will also give you some great picture shots for your social media platforms. Scuba diving is a popular yet expensive activity all throughout the Maldives Atolls. Some of the diving sites in the Maldives rank amongst the top diving sites in the world. As the island of Vaadhoo is protected by a reef, diving is made entirely possible here. While underwater, individuals can expect to see an array of colourful reef fish and some larger fish that venture till these waters. Another famous activity in Vaadhoo Island is kayaking. The best time to brave the waters is probably just as the sun is setting as individuals can not only enjoy the gorgeous hues of the sunset atop the waves but can also enjoy the sea of stars phenomenon right from the middle of the action, as it turns dark. Other activities that visitors can be engaged in is swimming, snorkelling, and tours set by the hotel staff.